Addington Oil Corporation’s main location in Weber City, VA offers highway, farm and kerosene for customer pickup. We offer on-site fueling and this location has an excellent area for large trucks to fuel. We offer Toyostoves for sale, as well as parts and repair. The large Toyostove sells for $1549.95 and the small Toyostove sells for $1249.95. James R. Addington founding Addington Oil Company in 1932 at the depth of the Great Depression. He was a commission agent for the Sinclair Refining Company. At that time, kerosene was the largest selling petroleum product because electricity was not available in all areas of Scott County so the kerosene was used for lighting. As cars became more common, gasoline became the largest selling product. As World War II came along, all petroleum was diverted to the war effort. Having nothing to sell, my father went to work at Holston Army Ammunition in the pay roll department. With the end of the war, Sinclair Refining Company chose to pull out of the east coast of the United States. Both Shell Oil Company and Socony Mobil Oil were in an expansion mode so my father chose Shell and became a Shell Oil Jobber. After the war, business returned to normal and Addington Oil Company grew. My father suffered a fatal heart attack in October 1957 while I was in my 2nd year at the University of Virginia in Charlottesville. My mother, Kate B. Addington, took over and ran the company until I graduated in 1960. Upon graduation, I came back into the business and my mother was able to retire. 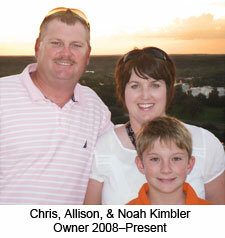 In 1993, my son-in-law, John Christopher Kimbler, joined us and learned the business from the ground up. Chris, Allison, and Noah Kimbler became the sole owners of the company in 2008 and hope to continue to grow the business for many years to come.